I was so excited to get the chance to read Fast Balls by Tara Lain. 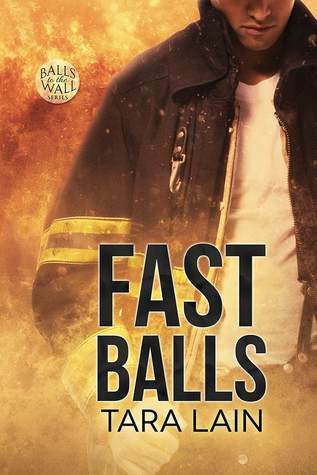 Fast Balls is the fourth book in the Balls to the Wall series. I loved reading Fire Balls, and so I was so excited that Fast Balls is about Jerry who was a friend of Rodney in Fire Balls. I am so glad that Jerry got his own story and with the most unlikely person, Mick, that we also met in Fire Balls when Rodney knocked him out. Mick was such an unlovable homophobic character in Fire Balls that I was excited to see how he changed and figured out who he really was and what he believed in instead of what his homophobic fanatical preacher red-necked father thought and had been shoving down his throat his whole life. I loved Mick. He had an air of innocence to him even though he was a mathematical genius and could have had any number of jobs. He wanted to help and save people, and so he became a firefighter. And at first, he was a real jerk to Hunter and Jerry who were the two gay firefighters at his fire station. But his beliefs are challenged when he gets to know both Hunter and Jerry and how nice and friendly they both are and how well liked they are at the station. I really liked watching him change and grow and come into his own and go after what he really wanted, which is Jerry. Jerry isn’t having the best day at the start of the book. He just got dumped by his boyfriend, Bill, via text message about not coming back from a job interview that he was going to turn down. Now Jerry’s without a boyfriend, a new roommate, and his date to the Firefighters Ball. Jerry has self-esteem issues and doesn’t see himself as being smart. So he compensates with dating smart people. However, they don’t fulfill his need to have somebody need him. And although they are all attractive, they really aren’t his type. He’s attracted to manly men like Mick, the homophobic jerk at his station. So when Mick notices that Jerry isn’t his normal happy self, he tries to be nice to him and make him feel better. And he continues to do so. I loved how Jerry helps Mick figure out his sexuality, and it also fills that hole he has about needing to be needed. I really enjoyed getting to see David, Gareth, and Edge from Volley Balls, Rodney and Hunter from Fire Balls, and Adam and Sky from Beach Balls. I love that they are all interconnected as friends, and I like the little glimpses into their lives and how they are doing. I also love how the series is set in Laguna Beach which is close to where I live, and so I know the various places that are mentioned in the book. I also enjoyed the excerpt of the next book in the series, High Balls. It sounds really good, and I can’t wait to read it. So thank you, Tara Lain, for another great book.